Goway Travel is inviting globetrotters to sleep under the Northern Lights, adding Finnish Lapland to its ever expanding portfolio of destinations. Kakslauttanen Arctic Resort is the world’s leading premium Arctic resort, located 250 km north of the Arctic Circle in Finnish Lapland. Surrounded by the Arctic wilderness, the resort is best known for its glass igloos and Arctic art, all designed to showcase the Northern Lights in winter, and make the most of the Midnight Sun in summer. 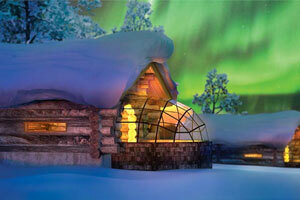 Goway has introduced a new three-day stay at Kakslauttanen in Finnish Lapland, starting at $709. From late August to the end of April, travellers can enjoy the unique experience of sleeping under the famous Northern Lights. During the day, guests can explore the wilderness with a range of activities, returning each night to first class facilities and a clear glass roof, ready to enjoy one of the world’s most unique natural spectacles from the comfort of their room. The glass igloos are closed during the summer, when guests can instead enjoy the unique beauty of Lapland under the Midnight Sun. Intrepid globetrotters can experience the Arctic wilderness on reindeer, husky, horse or snowmobile safaris. The area is also known for its world-class cross-country skiing. Guests can also learn about the fascinating culture of the Sámi, the only indigenous people in the European Union area. All glass igloos have single beds. Each small glass igloo has a toilet and a small basin, while large glass Igloos have a toilet, basin and shower room inside.